This listing includes the original game CD. An on-screen manual is also included. The box is pictured for reference only and is not included. The USS Vincennes is on patrol in the Persian Gulf. Tensions are high, especially in an area where most of the world's oil comes from. Suddenly, a blip appears on the radar screens. According to the ship's computer, there is no traffic scheduled for that sector. The target is classified as hostile. Radio contact with the target is attempted on standard military frequencies, but there is no reply. A decision is made, a button is pressed, and 30 seconds later an Iranian airliner is blown out of the sky, taking hundreds of civilian lives with it. This was an unfortunate incident, but it highlights the deadly accuracy of the Navy's premier air defense platform: the Ticonderoga/Aegis. 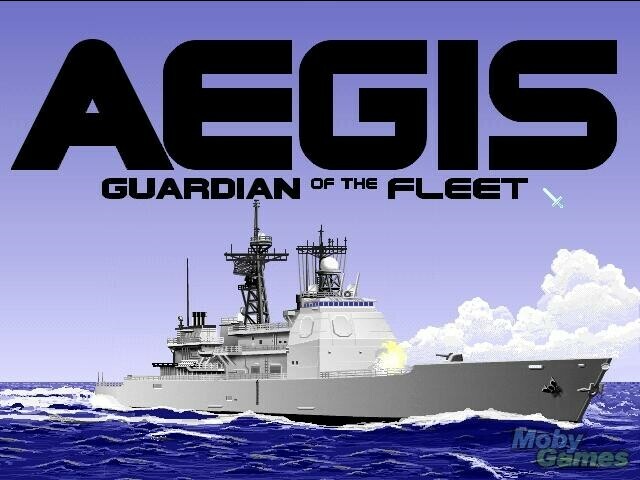 Aegis: Guardian of the Fleet is a simulation of the U.S. Navy's Ticonderoga class guided missile cruiser. Over 100 missions are available in 7 battlesets and a training area. 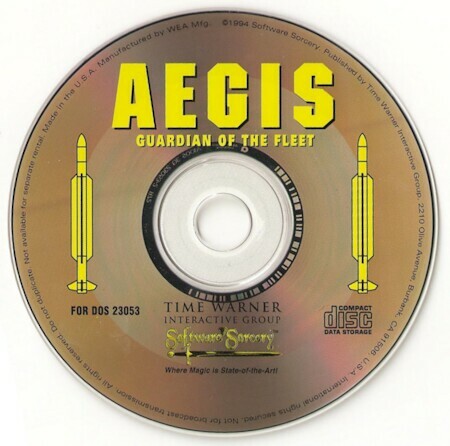 AEGIS could be called a "system simulator" since it individually models many of the offensive, defensive, and sensor systems present on the Tico class. There are 3 difficulty levels: beginner, intermediate, and advanced. At beginner level the player can see all enemy forces whether or not they are detected by sensors, as well as control the enemy forces. Intermediate level enemies have to be detected and are completely computer controlled. However, they will not use countermeasures when fired upon. At advanced level the enemy forces will use countermeasures. The player has the option of playing a single mission, all the missions in a single battle, or a campaign, which is every mission in each battleset. The 7 available battle areas are: the Falklands War, Libya/Tripoli, Persian gulf, Desert Shield, Desert Storm, Black Sea, Adriatic Sea. The Tico class was undergoing sea trials during the Falklands War, so this scenario is a "what if". The Black Sea and Adriatic scenarios are also fictional. Once a mission is selected the player's first stop is the bridge. All the other screens can be accessed from here, however, hot keys can do the same more quickly from anywhere, so this screen is redundant and of no use whatsoever during the game. This is a prime example of the awkwardness of the game's interface. There are 3 screens (the bridge, handset, and CIC screens) that all have the same basic function of allowing you to switch to the various other screens available (like radar, sonar, and fire control). These 3 screens present you with no information about the battle in progress, and the hot key commands eliminate the need for these screens. A player will spend most of his or her time at the Tactical Plot screen. 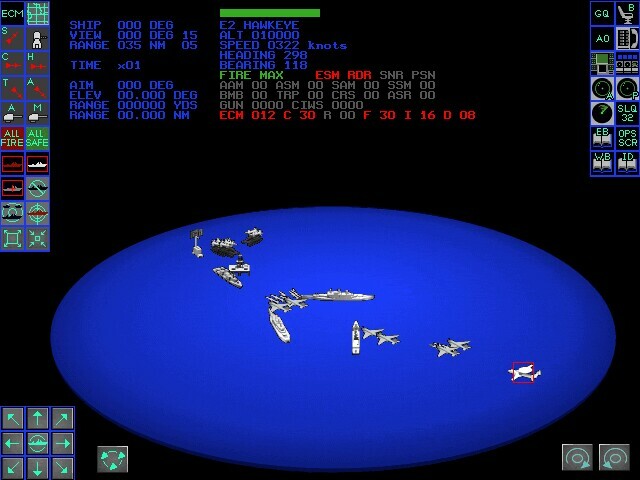 A 3-D display of your ship and the area surrounding it is presented along with icons allowing access to all functions of your ship, as well as all other friendly assets. Here is more redundancy in the interface. The entire game can be played from the tactical plot, making none of the other screens in the game necessary. In most missions your Tico alone does not have the firepower necessary to accomplish the objective and you must use the friendly forces at your command to engage the enemy. The tactical plot is the only place where you can control them. A mission ends when either all enemy forces present are destroyed or you voluntarily end the mission. A success/failure screen follows and the mission is summarized. Games can not be saved during missions, but only between them.